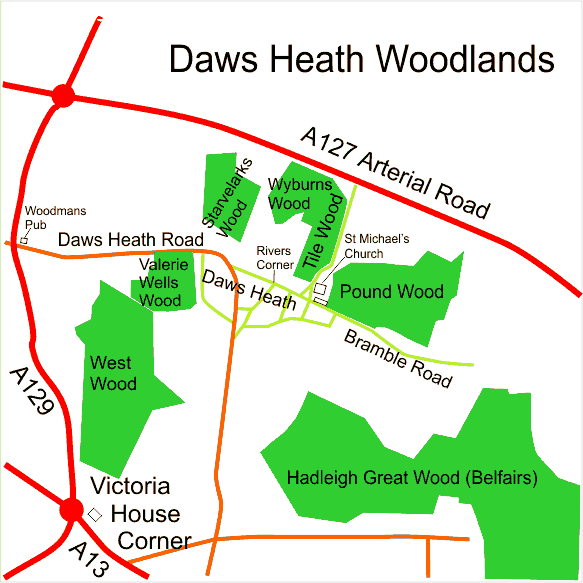 Pound Wood is a 23 hectare (55 acre) block of ancient woodland in Daws Heath, north of Hadleigh in south-east Essex. It lies in Ordnance Survey grid squares TQ 8188 and 8288. Its size and complex geology results in a great variation in woodland types and most of the wood was in existence from at least Medieval times. Pound Wood was purchased by the Essex Wildlife Trust in 1993 and is managed as a nature reserve with free public access. Most of the wood lies in the parish of Thundersley, the eastern section falling within Hadleigh. On its southern edge it abuts the village of Daws Heath which now forms a northern suburb of Hadleigh. Road access is via Bramble Road and St Michael’s Road. St Michael’s Road runs north between Pound Wood and Tile Wood to enter the westbound carriageway of the A127 but this is an unsafe junction and best avoided. There is no access to St Michael’s Road from the eastbound carriageway. The reserve is best approached via the A129 between Hadleigh and Rayleigh or from the A13 at Hadleigh Church. There is no reserve car park; visitors must not use St Michael’s Church car park which is provided for church or hall use only, and could be shut at any time. Adjacent roads may be used for parking but please respect the needs of local residents. The nearest bus stop is at River’s Corner in Daws Heath Road, 200 metres from Pound Wood and there is an hourly Monday to Saturday service (3) which runs between Southend and Chelmsford via Leigh, Hadleigh, Daws Heath and Rayleigh. The service is operated by Regal Busways. This is a direct link to the timetable. Pound Wood is open to the public at all times but visitors are asked to keep to the paths and avoid taped-off areas where the wardens and volunteers are undertaking management work. Please also avoid entering the non-intervention areas in the south and south-eastern sections of the reserve where sensitive habitats are being protected from disturbance.